The new OMEGA™ weather resistant temperature-to-wireless transmitters are weather-resistant, battery-powered transmitters that transmit their readings back to a host receiver up to 120 m (400') away. UWTC units can be programmed for any of 9 thermocouple calibrations. The UWTC will transmit the measured and ambient temperatures, along with RF signal strength and battery condition to a remote host, such as the UWTC-REC Series. 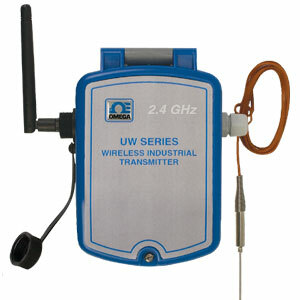 You can program the UWTC to transmit your data at rates from 2 sec to 2 min. Data received by the UWTC-REC can be received and displayed on your computer, using the TC Central software included with eachcompatible receiver. TC Central software can turn your PC into a strip chart recorder or data logger so readings can be saved and later printed or exported to a spreadsheet file. Replacement battery, C cell 3.6V lithium. Comes complete with antenna, 3.6V “C” battery, and operator’s manual. Please see PDF for additional receivers and accessories.